Explanation: On April 30, a Full Moon rose opposite the setting Sun. 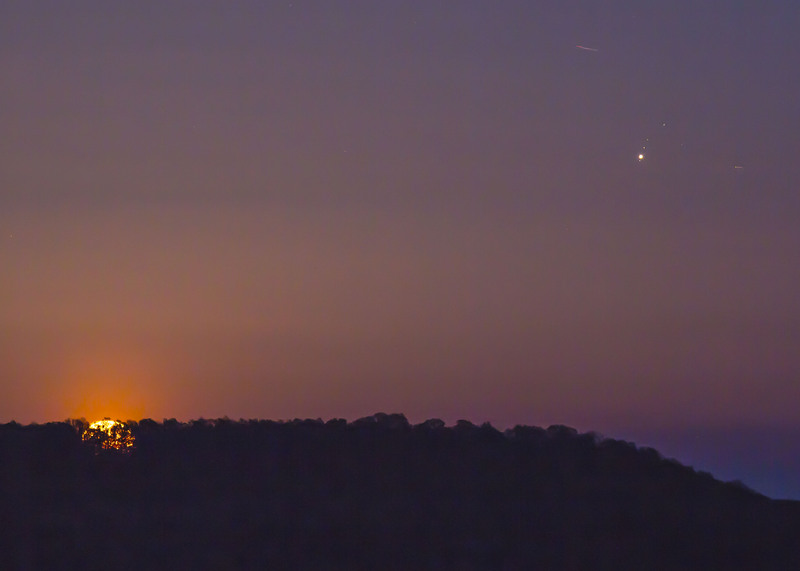 Its yellowish moonglow silhouettes a low tree-lined ridge along Lewis Mountain in this northeastern Alabama skyscape. Sharing the telephoto field-of-view opposite the Sun are Earth's grey shadow, the pinkish Belt of Venus, and bright planet Jupiter. Nearing its own 2018 opposition on May 8, Jupiter is flanked by tiny pinpricks of light, three of its large Galilean moons. Europa lies just below Jupiter, and Ganymede and Callisto are just above. Closer and brighter, our own natural satellite appears to loom large but the Moon is physically a little smaller than Ganymede and Callisto, and slightly larger than water world Europa. Sharp eyes will also spot the trails of two jets across the clear evening sky.